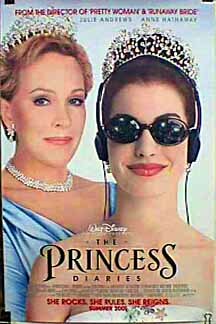 Description: Typical San Francisco teenager discovers she's heir to the throne of a small European country. Hijinks ensue as she endures a makeover, princess lessons, and the press. As you can see from this month's book reviews, I read the book a few months before I saw the movie. The book is better, but the movie is suitable popcorn fare for a summer matinee. After her father's death, Mia receives a surprise visit from her grandmother. Turns out she's a princess and next in line for the throne. This is not good news to Mia who is still uncertain and awkward in the middle of her teen years, but then she gets a makeover and some lessons in trusting others and herself. This movie is full of plot holes and most of the secondary characters are woefully underdeveloped, but really who cares when you've got attractive teens, a kicky soundtrack, and a happy ending. Anne Hathaway is enchanting as Mia and does a very good job of showing her weaknesses without making her wimpy. This is definitely a movie for younger audiences or those who are easily amused (such as myself). I saw it with a male friend who liked it, but kept asking questions about the rules of succession and protocol. Remember, it's just a fluffy movie. Don't ask any serious questions. Description: Mind meltingly cool fantasy. Modern day NY cop, Sara Pezzini gets a magic gauntlet/weapon/thing that changes all of her peceptions. I loved this movie. The eleven episode run on TNT rocked as well. The plot is pretty basic to fantasy. Tough gal is driven by a desire for revenge. Gets a magic weapon. It gives her powers and perceptions and yet…Witchblade deliver style in spades. The whole idea that time is flexible. Great weird shots in which Sara is in real time, but the freeway behind her is in fast forward. Matrix style special effects but for a reason, she perceives time differently. Yancy Butler delivers on a tough, yet tender Sara. Tough female cop, busting heads, taking no prisoners. Even without the magic Witchblade, Sara kicks. Other notables would be the insanely cool Ian Nottingham as played by Eric Etebari. Slightly deranged, but in a warrior poet sort of way. Generally kicking posterior and saying cool things. Vibing Sara. Course, everyone vibes Sara. Billionaire Kenneth Irons, as played by Anthony Cistaro, says portentious things and vibes Sara. Sara’s new partner Jake McCartey, played by David Chokachi, majorly vibes Sara. Heck, Sara’s dead, played by Will Yun Lee, but still moving partner vibes Sara. So yeah, cute guys, great plot, strong female lead=good stuff. Though I will say, it is not the kind of show that you can do anything else while watching. You will loose the plot, which is fast, complex, constantly seeding little clues, and requires constant attention.